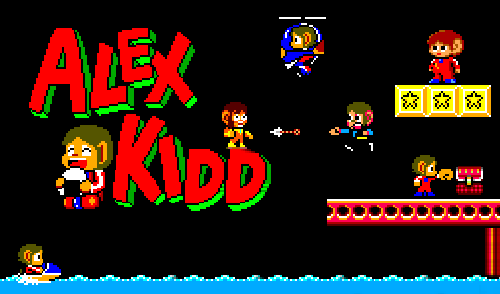 Alex Kidd was Sega's original cartoon hero for the Mark III and Master System and was voted here as the most memorable character in the console's original title line-up. He may not have the vast history or game appearances of some of the other characters on this site, but the fact remains he was and still is the character most readily associated with the Master System. Furthermore, he was Sega's first official mascot to give their reputation in the console market something to identify with. His first game was "Alex Kidd in Miracle World," which was released in Japan in 1986 and still widely considered to be the best game in the series; possibly the most recognised release for the SMS. However, in spite of the popularity of the game and the importance Alex served in the history of the console, few people know his entire story and the reasons for his eventual downfall. Alex Kidd is not only a lesson in the early history of video games, he's also a lesson in marketing and how a character's image is essential before even deciding to hit the market with game-based trinkets. Want to learn why and more about this classic character? Read on. Alex Kidd is best characterised by his big ears, strange haircut and red romper- suit. He was designed by the mysterious Ossale Kohta, pseudonym of Kotaro Hayashida, who first programmed Hustle Chumy for the SG-1000 and later wrote the entire scenario for Phantasy Star, though in spite of his importance in the industry no one is really sure what he looks like. Citing influences such as Dig Dug, he first joined Sega in 1983 after responding to an advertisement he saw in a magazine. On the design team, he was given the mammoth task of creating a game to compete with Nintendo's Super Mario Bros., by then an incredible success for the Family Computer almost the instant it was released. Originally, the concept Hayashida had in mind was to make an adventure-type game, but the final descision rested on the title we now know, which he categorizes as more of an RPG-Action title than a simple platformer, even citing Star Wars as an indirect influence on the game as a whole. Alex was merely a culmination of everything Kotaro had been working on up until that time, and as suggested by his earlier work, an almost inevitable venture. Alex Kidd is prince of a land called Radactian on the planet Aries. After spending several years learning shellcore (a fighting art, originally conceived as possibly involving the usage of weapons, but this idea was canned), he learns from a dying man that his land is in danger. With the map he receives and his Sun Stone medallion he sets out on his journey and the game begins! With eleven levels, tons of secrets, a variety of interesting characters, castles and the famous Janken matches, this title put Sega on the map as a contender in the console market and they tried everything in their power to distinguish it from anything else released at that time. As a side note, this explains the strange button issue for Alex's first game, which Hayashida admitted was yet another attempt at being different. It's unfortunate the Master System didn't receive the same amount of attention as Nintendo's console, had it one can only wonder how far Alex Kidd would have gone in video game history. However, Sega did not exactly follow through on what success he had and the sequels to Miracle World were certainly much less than what was expected, leading to a tragic end to this character. Let's learn a bit about what came next. 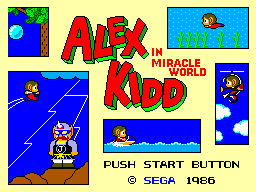 Sega, realising the success of Miracle World, decided to adopt Alex Kidd as their official mascot much in the same way that Nintendo used Mario. Shortly after the release of Miracle World, The Lost Stars was released in the arcades. This game was a radical departure from the gameplay of Miracle World, following the format of a typical platformer. It seems Sega was attempting a two-fold approach with the character, using an arcade appearance to bolster the console as well as Alex's image. However, it seems they merely relied on image alone instead further developing the ideas behind it. In this sequel, Alex has to retrieve the twelve stars of the Aries Contstellation, which were stolen by Ziggarat, who previously attempted to capture them 5,000 years ago but was stopped by Alex Kidd. Now, you have to go through twelve levels and then go through them again to save Miracle World. The Master System version was released later in 1988 and despite being a decent port of the original it was still considered to be quite a poor or less than average platformer in comparison to other titles at that time. It would seem that the creators decided to aim the game at an even younger audience than the previous title when you look at some of the characters and backgrounds, but it's tough to say. Then comes his next appearance. 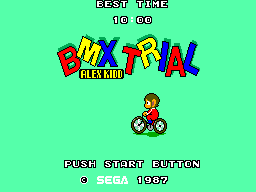 Sega released Alex Kidd : BMX Trial for the Mark III in 1987. 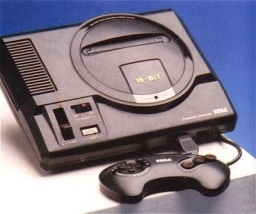 The game was only ever manufactured for the Mark III in Japan because it required Sega's Paddle controller, which was not released elsewhere (more about this in our site interview). 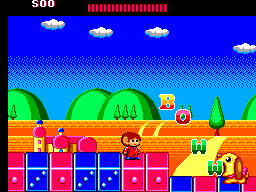 The game had nothing in common with the previous games at all, except that it features Alex Kidd and makes some mention of Miracle World, but without providing a further story or plot. BMX Trial thus uses some of the elements of the Alex Kidd series, such as riding around Radactian, but though Alex Kidd plays a major role in the title he's simply there; the programmers really didn't do anything with the basic concept. Once more Sega appears to have been milking a character whose history had yet to be sufficiently developed, this being the trend in his downfall. At this point, recongnising the popularity of Alex Kidd, the wheels of Sega's merchandising department began to turn, even going so far as to authorise an Alex Kidd board game and pencil case. Sega fans, though, were still optimistic that something good would come out of the little guy. When 1989 was booming, Alex Kidd: High-Tech World was released on the Western market, in addition to Sega's brand new 16-bit console, the Megadrive (Genesis in the states). The latter was good, the former, a serious mistake. Let's delve into that. Once again, Master System fans were disappointed by what turned out to be another less than memorable sequel. This time Sega decided to place Alex Kidd in a RPG/Puzzle/Adventure-like environment. The idea itself is great, and was popular for a time through the late 1980s and early 1990s. Unfortunately, High Tech World was not among the great "point and click" type games and its release dealt further damage onto Alex's bruised reputation after The Lost Stars. Here's why. 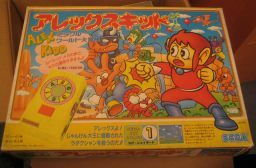 Alex Kidd High-Tech World had already previously been released on the Mark III in Japan, but with totally different characters. 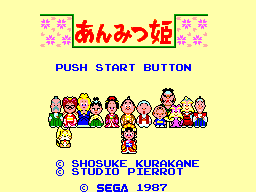 There, the game featured characters from a Japanese anime TV show called "Anmitsu Hime" - the main character originally being Princess Anmitsu, which can be roughly translated as Princess Sugar. The series didn't even last a year in Japan so it's clear why Sega wouldn't want to have a minor, completely unknown character in Europe and North America. Anmitsu Hime involves solving puzzles following along the plot of the cartoon. 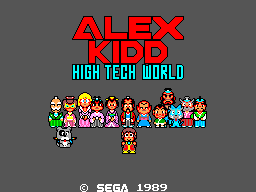 For the rest of us, Sega decided to change the concept and some of the graphics while using Alex as the main character, likely to keep the competition previously started with Miracle World going, even though the game essentially made no sense. Alex Kidd suddenly had Japanese parents and friends and in order to get to an arcade has to find pieces of a map and then battle some ninjas. The result is one of the most recognizably worst titles for the SMS. It's obvious that Sega was trying to cash in on Alex Kidd's image to create a fanbase similar to Mario's without really working on the actual gameplay. Without this core element, which is where video game characters truly find their foundation, the image of Alex would slowly sink away, as you'll find when you read on. With the release of the Megadrive, Sega decided to take Alex to the next level. The advanced capabilities of this new console allowed Alex to appear bigger, more colourful and better looking than ever. 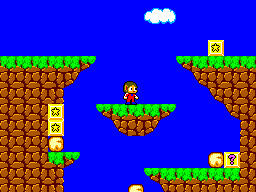 The game was named "Alex Kidd in the Enchanted Castle" and seemed to borrow heavily from both Miracle World and the Lost Stars. They didn't do much to the original idea, however, merely using Alex and mentioning his father. Miracle World and the idea behind the original game is almost entirely absent from this title, which takes place on planet "Paperock." The game was average at best - it never achieved anywhere near the popularity of the original Miracle World and this is likely due to the fact that it merely draws on some of the old ideas without doing anything new, placing it on the same level as other minor 16-Bit platformers. Alex Kidd may have just been a little too cutesy at that time for a generation that craved the action provided by games such as Altered Beast and Golden Axe, and the title did not sell nearly as well as Miracle World. It wasn't the end yet, however. 1990 proved you can never keep a good Kidd down and Sega released what would be the final Alex Kidd instalment on the Master System, or in fact, any system up to the present day. The game was a release that took the story and character abilities from the arcade hit Shinobi and gave them to Alex Kidd. From this we get the rather predictable title of "Alex Kidd in Shinobi World." The game turned out to be an interesting mix of everything that made both Miracle World and Shinobi great, while adding new abilities and addictive gameplay, though many fans agree the length of play is too short. Unfortunately, though the final release seemed to revive the image, this game being judged a success by Master System fans everywhere, Alex Kidd vanished. The Megadrive was revolutionizing the video game industry and by this time Sega had chosen a new mascot who would become a symbol for the company over time, Sonic the Hedgehog. With a shiny new 16-Bit console, Sega wanted a super powered, super fast hero. When Sonic arrived on the scene in 1991, breaking barriers for its speed, use of colour and fantastic playability, Alex was immediately relegated to being packed into Master System II consoles, while Sonic was living it large on 16-Bit and even on the SMS. Alex's career was pretty much over as soon as the public caught sight of Sonic because he just made more sense and they worked with the games he was featured in, not just his image. Alex Kidd had his fate sealed and was then retired from his job at Sega, now rumored to reside at the same location as Professor Playor. Despite his enthusiastic fan-base, he has yet to be revived by Sega. If it ever happens, hopefully they'll do him justice and work on a proper sequel, but this is mere speculation. Interestingly, Alex wasn't entirely absent from the world, and in 2001 an ill-fated anime idea was developed, but never finished. This suggests that something may be in the works and only time will tell. The most important aspect of his history is that he represents a period in Sega's life when they were just beginning to experiment and compete in the console market and Alex was their first and most fated character. In a way, he paved the path for Sonic and things to come.